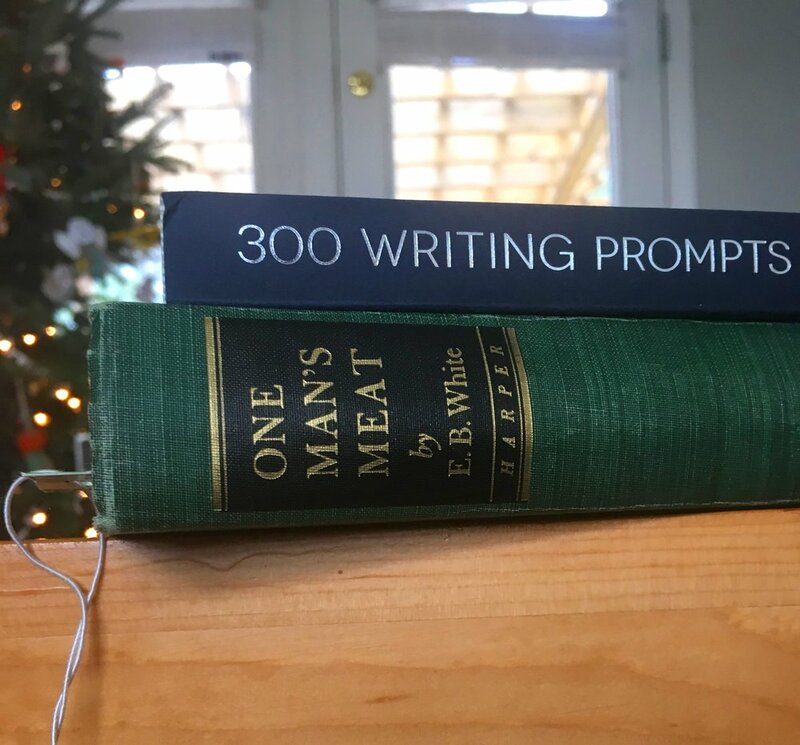 This year for Christmas, my mom gave me a book called “300 Writing Prompts,” and Dave gave me a poetry anthology edited by Garrison Keillor. One represents a return, one represents a new endeavor. I opened this gift from my mom, and she said, “I want you to start writing again.” I opened the gift from Dave and he said, “I want to read poetry with you.” Cue tears, in both cases. So what does this blog have to do with these gifts? Well, reading is an old friend who’s never left. Writing and reading go hand in hand. I’ve loved to do both since I was very young, and wrote copiously in journals from age 11 until we had Esther (two thirds of my life). I read Harriet the Spy at least 10 times (likely more), and truly believe that Louise Fitzhugh’s book and character sparked the interest in journalism in me while I was in middle school. I blogged at the very beginning with Xanga (what), pouring out angsty and cryptic teenage posts throughout high school and college, and then blogged intermittently in my early career and motherhood. But all my words have fallen by the wayside, and I’ve steeped my mind in the words of others for several years. training this girl to love books as much as we do. Maybe this year will be the zenith of my reading for a while, as I don’t know if I can sustain a book per week AND write the way I did in my 20s (daily, a minimum of four pages in my Moleskin). I posted a similar blog last December/January, looking back on my reading for 2017. So here are my thoughts on books I’ve read in 2018. I read more books this year than I ever have, even before I was married and had children (!). Not sure how, except that I like to compete only with myself. Also, audiobooks were a huge boon this year. Olive Kitteridge (Strout) was the best book I read this year. It is not lighthearted, and it does not have a happy ending. I am a staunch happy-ending fan, but this book was different. This book broke my heart open in ways a book never has. It grew compassion in me for groups of people I typically don’t think about very often (widows and the elderly, I am ashamed to say). It humanized these groups in ways popular culture and most literature does not. Do we not usually see the elderly as either sweet or sour, with no nuance or complexity? Olive is one of the greatest characters ever written — I cheer for her, I admonish her, I hurt for her, I long with her. This is a rare woman, and one I’d like to know in real life (although I would be both annoyed and intimidated by her, to be sure). The Wedding (Dorothy West) was a book club pick, and one I probably never would have come across on my own. It belongs to the Harlem Renaissance genre, which I studied in college, but had never read this one. I (and several others in book club) listened to what I thought was the full audio book, but we all discovered that we had listened to a poorly labeled abridged version, and missed huge chunks of the story. Regardless, the prose is beautiful, the story and themes are compelling, and the narrator’s voice for the version I listened to was slow and syrupy and absolutely perfect. I bought a paperback copy online so I could revisit this mixed-race, 1950s, Martha’s Vineyard novel. Another great book club pick (YA) - about San Francisco/Chinatown at the time of the huge earthquake. Honey for a Child’s Heart (Hunt) is one my sister-in-law, Mary, has talked about many times, and I finally read a digital copy while we were in Washington this summer. I loved it SO much I bought a used copy to refer to in the coming years. It talks about the power of good children’s literature to shape a child’s heart and worldview, and comes with a very lengthy bibliography. Thankfully, my very favorite secondhand bookstore in all the world is in Dave’s hometown, and I was able to find quite a few of the picture and chapter books Honey recommends for our home library. I was pleasantly surprised to find that even though this book is quite old (and is in its 10th printing or something) and written by conservative Christian educators, they are big fans of Harry Potter. When I first heard about Harry Potter at age 14, controversy was raging in the Christian community about whether these books were “demonic” and therefore unsuitable for children (eyeroll). The point Hunt makes in this book is that children are more discerning than we often give them credit for and no one is going to learn how to cast spells by reading Harry Potter. The delight of the story is more instructive than any particulars about magic, and anyway, didn’t Tolkein rely pretty heavily on wizards too? On that note, I finished Harry Potter and the Deathly Hallows (the final book, for all you non-fans) this fall, the second time I’ve done so, and I intend to read the whole series again over the next few years. Why not? Hammocks + books on a PNW summer day. Bliss. I read The Island of the Blue Dolphins (O’Dell) cover to cover in a couple of hours in a hammock in my in-laws’ backyard. It was a delight. The last time I read it, I was probably 13 and had plenty of Anne Shirley dreams about being shipwrecked or kidnapped by pirates. Rereading at 32 allowed me to remember that girl inside me, and also marvel at this storytelling, and the fact that it is based on a real person. We’re reading it again for book club this month, because everyone needs a good adventure story now and then (when you’re not on your next cycle of Harry Potter or Narnia, duh). I am 2 hours away from finishing the audio version of The Gospel Comes With a Housekey, and a few months ago I also listened to The Secret Thoughts of an Unlikely Convert, both by Rosaria Butterfield. Don’t read anything by this lady if you don’t like getting kicked in the pants (Dave’s words while listening with me one night: “Man, she’s a ballbuster”). But if you want your worldview challenged, if you want to sharpen your reasons for why you believe what you believe, if you are searching for answers to hard questions about sexuality, faith, hospitality, sacrifice, service, and essentially what it means to follow Jesus, these are some of the best books I’ve read on these themes (and others). There is nothing vague and esoteric about these books, even though Butterfield is a former women’s studies and English literature professor. She is straight up and very vulnerable, and I am so thankful. Just a picture of me crying when I finished this book. While we are talking about women’s studies and literature, Madame Bovary (Flaubert) was also quite a kick in the pants. I heard someone talking about it on a podcast, and how it changed her entire way of being at age 18 when she realized that romanticism would destroy her as it destroyed the main character. This, paired with What Alice Forgot (Moriarty), which I read just before/during Madame Bovary, made me incredibly grateful for my life, especially my marriage and children. Sometimes I am tempted to fall into the comparison trap with my friends and relatives who are busy building careers and doing “important and meaningful work.” Though I KNOW on paper that being a mother is just about the most meaningful work that there is, it feels mundane and unseen and unimportant if I am having a bad day. Both of these books were reminders of what is precious, what is truly a gift that I did not acquire on my own. Reminders that even if I rebuild a career at some point, what will matter most at the end of life is the love that is growing now every day between me, Dave, Esther, Wes, and any future kids. Reminders that nothing is guaranteed, and that I am not immune to the temptations of materialism and self-indulgence. I hadn’t read The Call of the Wild (London) as a child (filed under: boy books, to my 12 year old mind), but saw it in Costco and got suckered by the beautiful cover. I loved it! I don’t know that I’ve read a book from the perspective of an animal without the animal actually talking or being anthropomorphized at all (I wasn’t much for Marguerite Henry). This was so well-done, so moving, and actually made me love my own dog more, although she would 100% die in the wild within 16 hours. Ha. Anything by Enid Blyton. Maybe I’m being totally unfair, but when I found a very cool vintage boxed set of her “Adventure” series at the used bookstore in Anacortes, I was pumped. Then so disappointed, and honestly, disgusted, by the blatant racism throughout the first and only book I read (The Island of Adventure). These looked so promising! And then this one was horrible! And the first book I read in 2018! At least things got better from there. And There Was Light (Lusseyran) was one of my book club picks (sorry, ladies), and is the true story of the man who inspired All the Light We Cannot See. The beginning, when he describes his initial experience of blindness as a child, was beautifully written, and then everything got very slow from there. I loved Doerr’s WW2 novel based on this story, and he did a great job weaving a compelling narrative, but the original biography was a bit too philosophical for me. I RAVED about The Far Pavilions in last year’s blog, and this year I picked up The Sun in the Morning (Kaye), her autobiography about her childhood in India. UGH. So slow, so boring. However, it did make me want to read Kim (Kipling), so that may go on my list for 2019. Had I not been hung up on Kaye’s book, I may have read 3-4 more books this summer and exceeded my goal. So what am I thinking about for 2019? I started (AGAIN!) The Brothers Karamazov, this time on audiobook. It is 33 hours unabridged. I sped it up to 1.5x normal audio, so hopefully that will help. The dang nicknames, ya’ll. STRUGGS. Have got quite a bit of Francis Schaeffer, loaned to me by my neighbor, including one about education that is proving to be a gateway to many other education books. That will be another focus in the first half of this year as we consider what to do for school for Esther this fall. I want to dedicate the first 6 months of this year to reading about early childhood education, particularly anything in the Charlotte Mason/Maria Montessori veins. I will, of course, also read TONS of children’s lit and “easy” novels. I have heard people raving about Celeste Ng’s Little Fires Everywhere, so I put that one on hold at the library today. Any other recommendations? Come at me!